Sherry vinegar is currently not as widely found or used as other more popular kinds of vinegar. Fortunately, this is changing as more cooks become aware of its incredible flavor. We are here to spread the word about this excellent ingredient and help you learn how to use it in your everyday cooking, from using it as a substitute for red wine vinegar to drinking it as sherry wine. Most everyone is aware of the health benefits of apple cider vinegar, thanks to smart marketing. However, sherry vinegar offers many of these advantages, plus the health benefits of the wine used in fermentation. 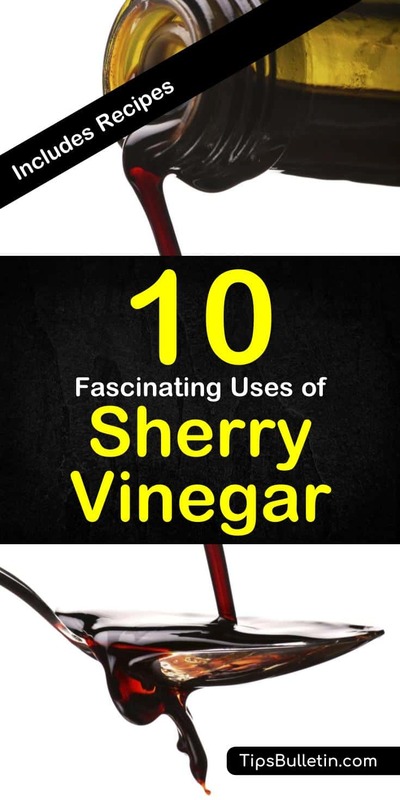 Keep on reading to discover 10 Fascinating Uses and Benefits of Sherry Vinegar. How is Sherry Vinegar Made? Where to Find Sherry Vinegar? Sherry vinegar is excellent for use in salad dressing. The flavors of your final dressing will depend on the quality of ingredients you use, so it pays to use the best here. All you need for a good sherry vinaigrette is 3 to 4 parts oil and 1 part vinegar. A good quality mustard acts as an emulsifier but is not strictly necessary. Whisk it all together, or fancy it up with herbs and aromatics as you desire. Add salt and pepper to the mustard to taste, and mix. Whisk in the vinegar and then drizzle in the olive oil. Continue whisking until all of the ingredients are combined. If you wish to add any other ingredients, like aromatics or herbs, do so now. Once you’ve whisked everything together, use immediately or store in a jar in the refrigerator. Shake the jar well to recombine the ingredients when you’re ready to use the dressing. Because of its acidic nature, sherry vinegar breaks down meat fibers, helping tenderize meat. Mix equal parts oil and vinegar. Add flavorings and aromatics as desired. Marinate beef for 24 hours, chicken for 4 to 12 hours, and seafood for up to 30 minutes. Sherry vinegar accentuates the flavors of vegetables. Sprinkle a little overcooked zucchini, summer squash, artichokes, or asparagus. Alternately, mix a 1/2 cup into your root vegetables before roasting. The roasting process will concentrate the flavors and add a punch to your dish. Sherry vinegar is an excellent choice for deglazing the pan when cooking meat or chicken. Flavor the sauce with aromatics like garlic, shallots, or onion, then deglaze the pan with vinegar and broth. See our recipe below. 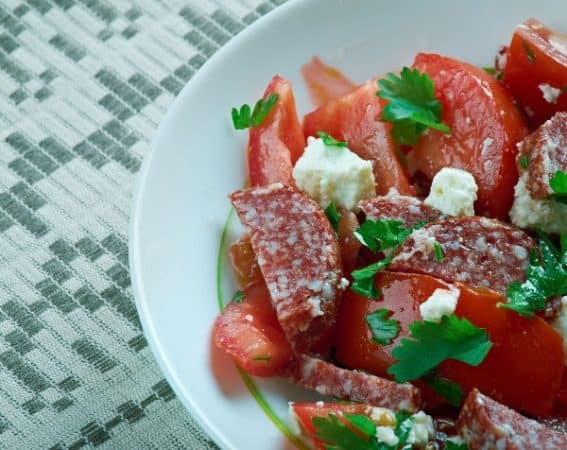 Sprinkle sherry vinegar over ice cream, strawberries, or goat’s cheese to balance the sweetness and add a little tartness. A small drizzle cuts the sweetness and balances the flavors in sweet dishes and desserts. Drizzle it in a pattern on the plate or sprinkle it over the top. Add to soups, stews, sauces, and casseroles to enhance the flavors. Like salt, a little goes a long way, but it makes the flavors pop. Add a tablespoon or two to your soups, sauces and casserole dishes, then taste for potency. Add more if desired, but don’t go overboard. Use high-quality sherry vinegar as an aperitif or “digestive” after a meal. Drinking vinegar after a meal is a healthy way to get the health benefits. Add it to fruit juice if you find it too strong to drink straight. Make a sherry vinegar and oil dip for bread. One of the benefits is that it moderates the blood sugar response to high carb meals. Using vinegar in your dip or spread helps you get the health benefits while enjoying your bread. Mix one part vinegar with three parts olive oil. Add herbs as desired. You can use sherry vinegar in any recipe calling for vinegar by replacing the vinegar. It has more flavor and depth than most kinds of vinegar and will add subtle flavor notes to the recipe. 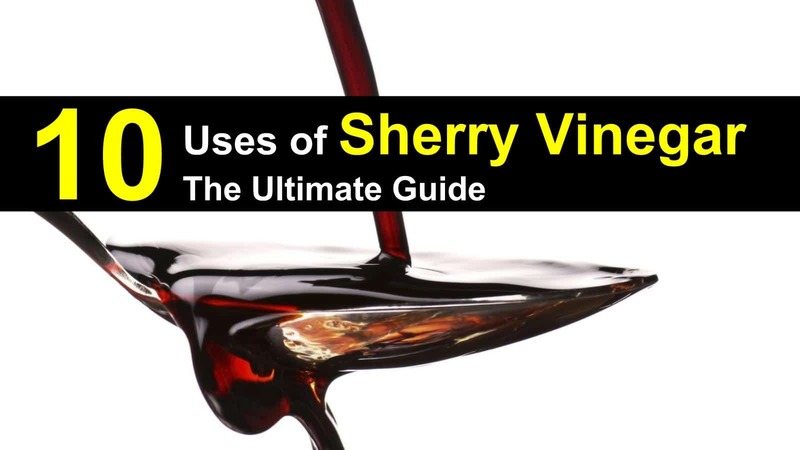 The vinegar definition and sherry definition are similar. The word ‘vinegar’ comes from the French term vin aigre, meaning sour wine. Sherry is a fortified wine that originated in southern Spain. During the production process of wine, yeast ferments the natural grape sugars into alcohol. 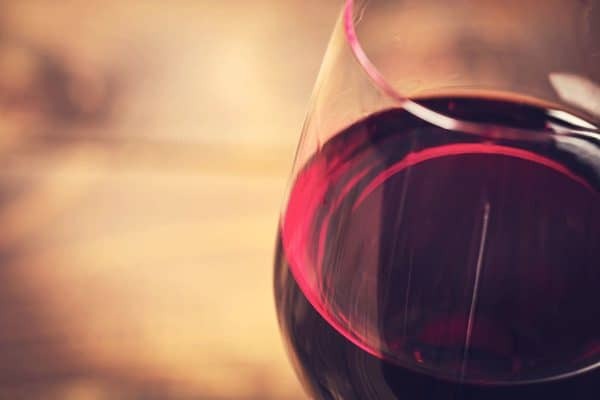 When acetic acid bacteria (Acetobacter), also known as the “mother,” are introduced to the wine, it ferments again, converting the alcohol to acetic acid. The process can be either fast or slow. The quick method accounts for the production of much commercial vinegar, however, slow fermentation allows the production of slimy accumulation of yeast and acetic acid bacteria, known as the “mother,” which can then be used to start the next fermentation. You will find cheap sherry vinegar on the market that is not authentic, meaning they were not produced with authentic Spanish sherry wines and do not come from the designated “sherry triangle” in Spain. Authentic sherry vinegar must originate in the Spanish Province of Cadiz, an area bordered by a triangle formed by the city of Jerez de la Frontera and the towns of El Puerto de Santa Maria and Sanlucar de Barrameda. For the best types, look for the Protected Designation of Origin status. The kind of sherry vinegar depends on the grape variety used and the region of origin. Most come from the Palomino grape. Pedro Ximenez grapes and small amounts of Moscatel grape also make excellent vinegar. Wines made from Pedro Ximenez grapes tend to be sweeter. Sometimes al Pedro Ximenez wines are added to Palomino vinegar to sweeten them. Sherry vinegar can come from a young wine or an aged wine. 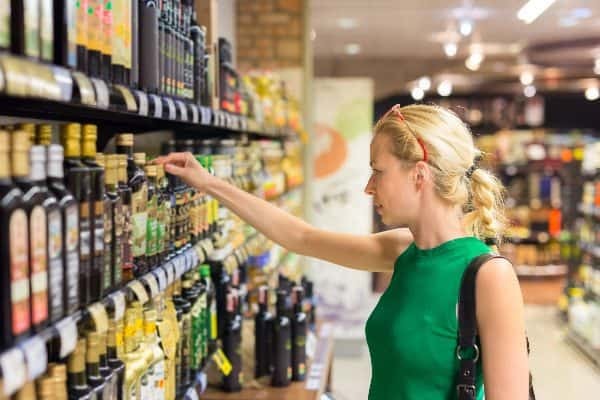 Manufacturers divide sherry vinegar into three age categories. Young sherry vinegar, known as Vinagre de Jerez, is aged for six months or more in oak barrels. Vinagre de Jerez Reserva ages for at least two years and Vinagre de Jerez Gran Reserva must age a minimum of 10 years, and possibly much longer, such as 12, 25, 50, 70 and even 80 years. The flavors develop over the years, and an aged Reserva or Gran Reserva has a complexity and flavor similar to aged balsamic vinegar. You will find several basic types of sherry vinegar on the market, along with seasoned varieties that have added sugar or flavorings. The best comes from the Spanish Province of Cadiz and have been aged to develop their flavors. Sherry vinegar is the product of acetic fermentation of sherry wines. Modern sherry bodegas, or wineries, produce sherry vinegar with the same care and respect they give to their wines. The young vinegar ages through the solera process. Old oak sherry barrels are stacked three or more layers high. The new vinegar goes into the top row of barrels and moves to lower barrels as it ages. In each transfer, the vinegar blends with older vinegar, giving it a more consistent and complex flavor. Once the final fermentation finishes, the sherry vinegar moves to the top tier of the solera system of oak barrels. After six months of aging, manufacturers bottle some (but not all) of the vinegar. Most of the remaining vinegar moves down a tier, with a small amount remaining behind to blend with the next vintage. Bottling begins with the oldest barrels. Younger vinegar, from the tier above, replaces the removed sherry vinegar and continues to age. The process continues, year after year, so that mature vinegar and newer vintages mix, producing sherry vinegar that is complex in flavor, brightly acidic, and consistent in quality. The taste is complex, a balance of sweet and sour. A good quality aged sherry vinegar will have notes of nuts and the oak barrels used for aging. The vinegar is potent, but not overpowering. Because of its acid nature, sherry vinegar will keep almost indefinitely on the shelf. It does not need refrigeration. Store in a cool, dark place in an airtight container. Are Sherry Cooking Wine and Sherry Vinegar the Same? Sherry cooking wine and sherry vinegar are both made from sherry wine, but they are very different products. Sherry cooking wine is wine, similar to Marsala or Madeira, while sherry vinegar is a fermented vinegar produced from sherry wine. Wine and vinegar have very different flavours, as do sherry wine and sherry vinegar. Are Sherry Vinegar and Red Wine Vinegar the Same? No, sherry vinegar comes from sherry wine, a fortified white wine, meaning it has a higher alcohol content than most wines. Red wine vinegar comes from red wine. Sherry vinegar is smoother and more flavorful than red wine vinegar. Sherry vinegar is becoming more popular and can sometimes be found in regular supermarkets. Be careful of the quality of supermarket brands. The most variety of sherry vinegar you will find online. The finest quality is often available at specialty food stores and online, and for the best quality, look for Vinagre de Jerez, Vinagre de Jerez Reserva, or Vinagre de Jerez Gran Reserva. We hope we have convinced you to give sherry vinegar a try. If you already enjoy the benefits and flavors of sherry vinegar, leave a comment telling me your favorite ways to use sherry vinegar, and use the buttons below to share to Facebook, Twitter, and Pinterest.